Christina takes over LA Pride. The girls were working it at LA Pride, posing away, when suddenly in their midst appears a Diva with so much star-power the whole city of West Hollywood rocked and the stage at LA Pride was electrified. 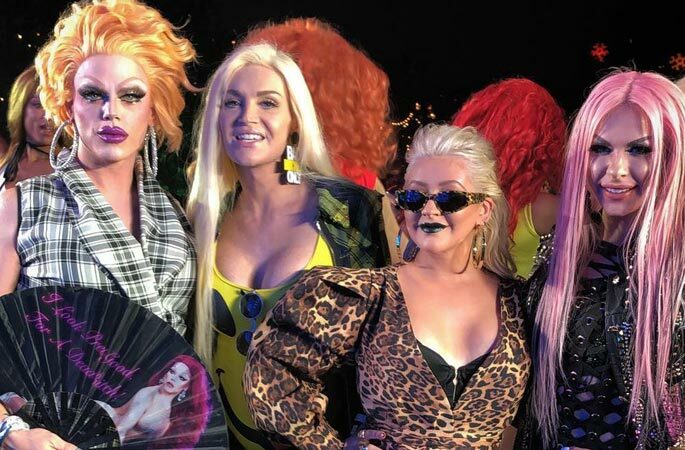 Christina Aguilera made a surprise appearance at Los Angeles Pride on Sunday (June 10), debuting a dance remix to her comeback single “Accelerate (feat. Ty Dolla $ign & 2 Chainz)” accompanied by local drag talent who were stunned at her appearance. It’s part of her first new release since 2012. “This is just for Pride, especially for you guys,” she shouted as she brought the crowd into the air. Over the weekend, loads of celebrities showed up to be a part of the festivities, but Christina’s appearance was a wild insertion into a drag contest. “It’s a new remix just for you guys,” she told the sell out crowd of 40,00 thousands at the show on Sunday night. “For Pride.” Wearing a leopard-print outfit, black lipstick and very pushy bustier for her big draggy splash. She was accompanied by a few stars of RuPaul’s Drag Race reality show and some local performers. She has followed “Accelerate” with Demi Lovato collaboration “Fall in Line” and last week’s “Like I Do” with GoldLink, with album Liberation — her eighth — planned for a release on June 15. Aguilera is known for her support of LGBTQ rights, including her hit 2002 hit “Beautiful,” and her work after the Orlando nightclub shooting in 2016.